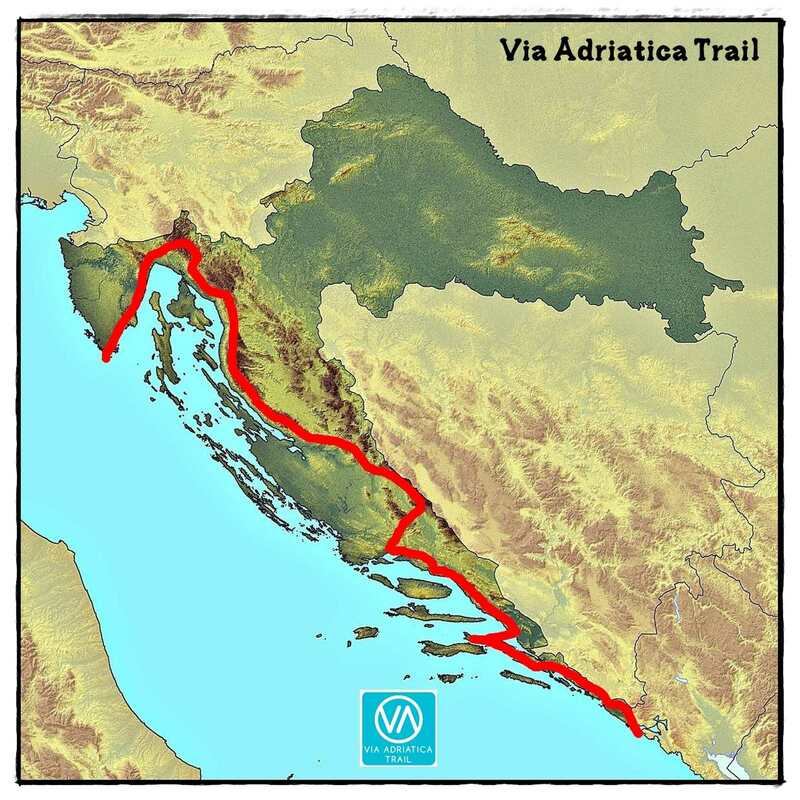 Via Adriatica is first long-distance hiking trail in Croatia. It goes all the way from the city of Pula in Istria to the southmost point near Dubrovnik through the mountains along the Adriatic coast. It covers 100 peaks – and uncountable breathtaking views. If you love hiking and challenges, this one is definitely for you. 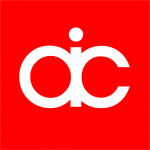 Almost everyone can enjoy Via Adriatica. 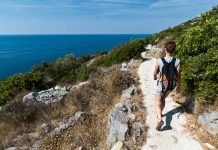 Experienced and active hikers can have a new challenge with multi-day trips, but the trail is also meant for those who want an active vacation with less demanding activities. 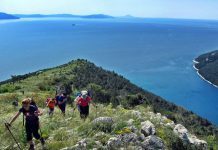 Via Adriatica offers different possibilities; from an enjoyable few hours walk/hike on some part of the route, touring several peaks in just one day, up to multi-day hikes or a thru-hike for those experienced and courageous. The trail is 1070 km long and covers 41 000 m of elevation gain. From ►Kamenjak to ►Prevlaka, you will pass 14 mountains with 23 peaks higher than 1000 m. Besides that, you will cross rivers, see lakes and visit a lot of national and nature parks. Most of the trail has usual red and white hiking marks mixed with blue and white VA marks. There are pointing arrows on the intersections. The trail is divided into 13 parts. The first stage covers 96 km in Istria and goes from Kamenjak to Poklon peak on the ►Učka mountain. Your hiking journey starts with easy to moderate hiking experience. The second stage is 92 km long and goes from Poklon through ►Gorski kotar to Plase. 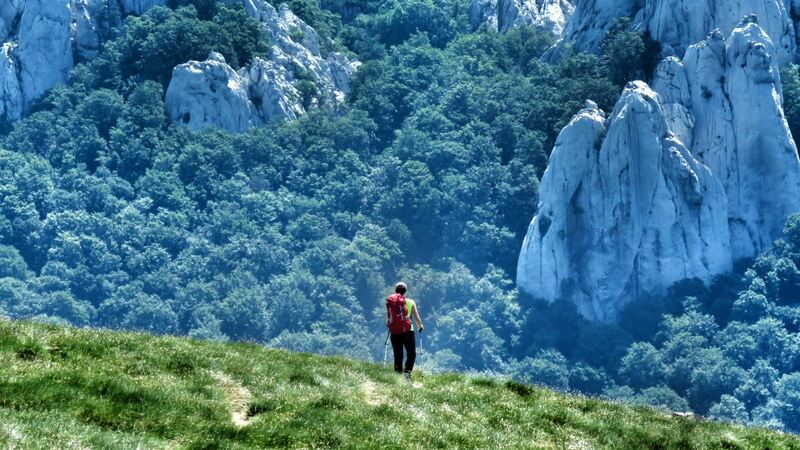 You will there visit ►Risnjak (1507 m), beautiful peak and national park, and Gorski kotar, a green heart of Croatia. The third stage, 76 km long with 2370 m of elevation gain, goes through Vinodol hinterland and leads you to ►Oltari – the beginning of incredible Velebit mountain. 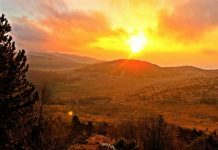 ►Velebit is a 100-mile long mountain and offers fantastic vistas. 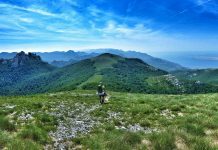 On the beginning of the fourth stage you will have a big climb to the ►Vučjak peak, and then you’ll go on the ridge of Velebit to the cute small mountain place called ►Baške Oštarije where you can sleep and eat. This stage is 58 km long with 2400 m of elevation gain. The fifth stage covers a big part of Velebit. It is 107 km long with 5500 m of elevation gain. 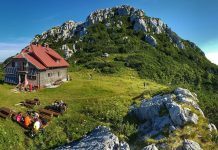 On this stage you will visit ►Vaganski vrh – peak – the highest peak of Velebit (1757 m), ►Sveto Brdo peak – a place with the most fantastic view of both sea and mountains, and ►Tulove Grede – a karst phenomenon. The sixth stage is a bit easier – 66 km long with 2000 m of elevation gain. You’ll say goodbye to Velebit and head towards ►Dinara mountain through ►Krupa river canyon, ►Zrmanja river spring and the city of ►Knin. 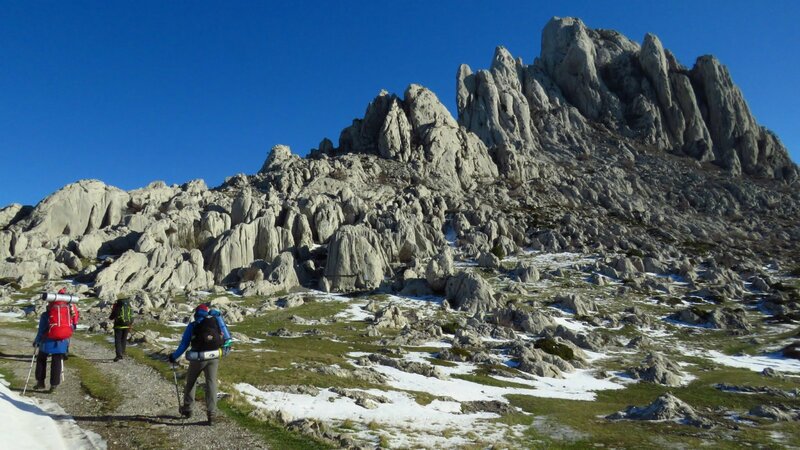 Stage seven will take you to the highest peak of Croatia. 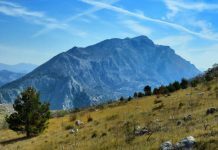 You will start in Knin, go through ►Krčić canyon, climb ►Sinjal (the highest peak), go down to the ►Cetina river spring and then climb some peaks again. This stage is 101 km long and covers 4400 m of elevation gain. 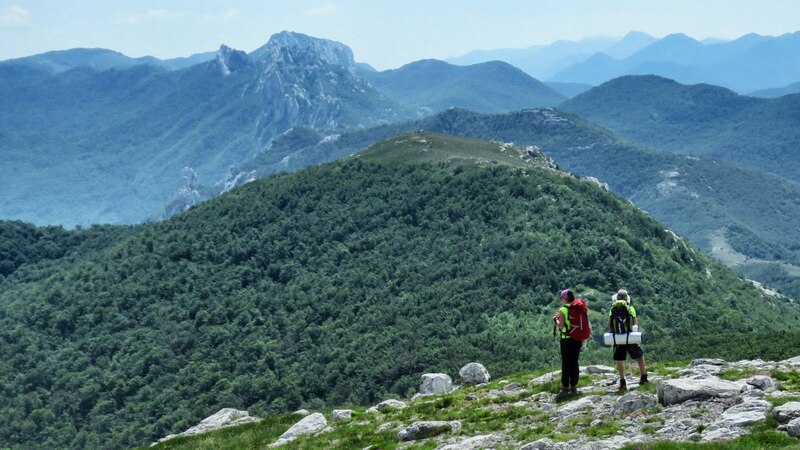 On eight stage you will climb ►Svilaja peak and then head trough rocky areas to ►Malačka, mountain house on the beginning of Dalmatian rocky mountains. This stage is 65 km long with 2500 m of elevation gain. 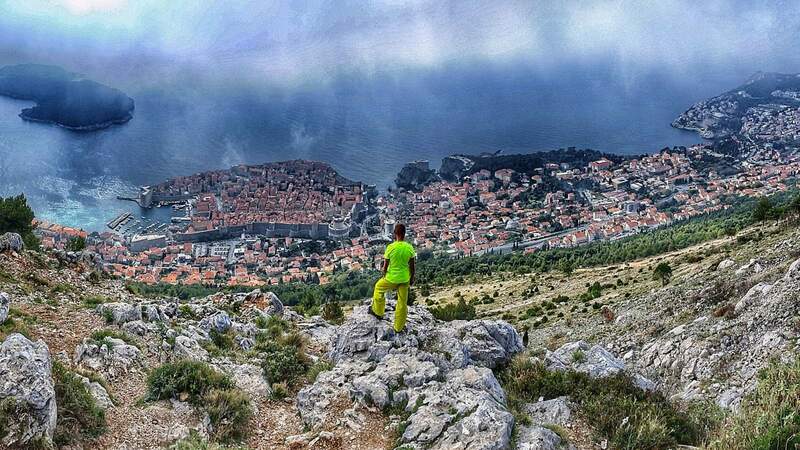 Stage nine overlooks coastal cities of ►Split and ►Omiš and goes up and down a lot. 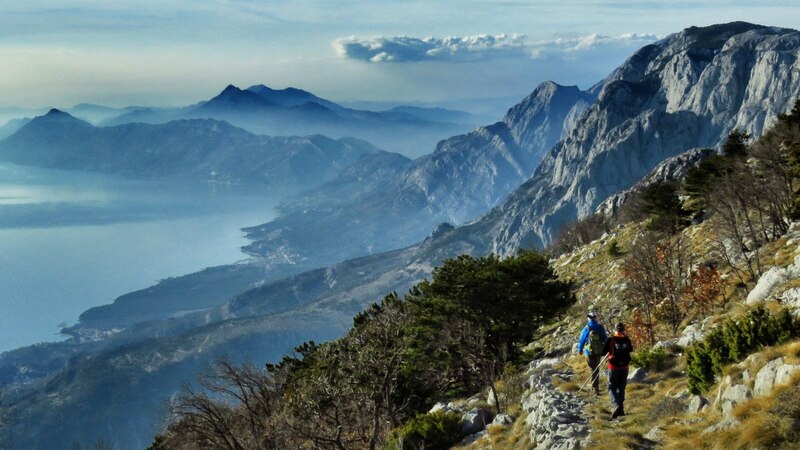 It is 80 km long with 3500 m of elevation gain and covers three mountains: ►Kozjak, ►Perun and ►Omiška Dinara. You will finish your tour at the seaside – in the beautiful small place called ►Brela. 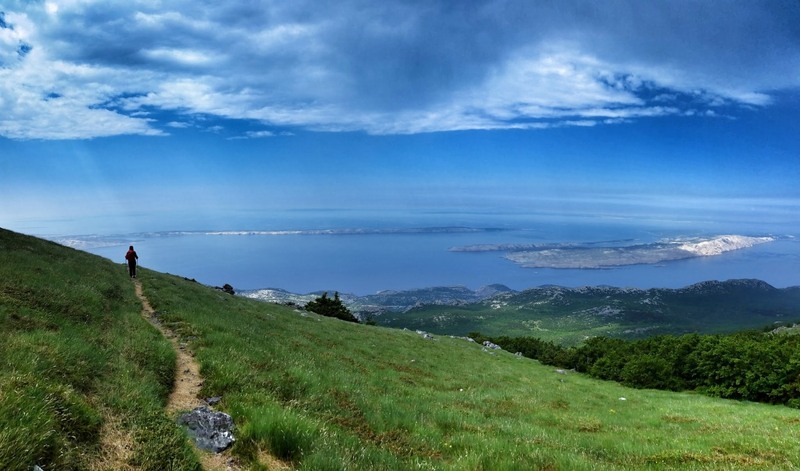 From Brela, you will climb on ►Biokovo – the mountain king of Dalmatia. Stage ten is 108 km long with 5740 m of elevation gain. After Biokovo, you will go around those karst mountains to some hinter parts only to cross them again, pass by ►Baćinska jezera – Baćinska Lakes and finish in the city of ►Ploče at the coast. On stage eleven you will need to take a ferry to ►Pelješac, where you can then follow marks again and visit the peak ►Sveti Ilija. 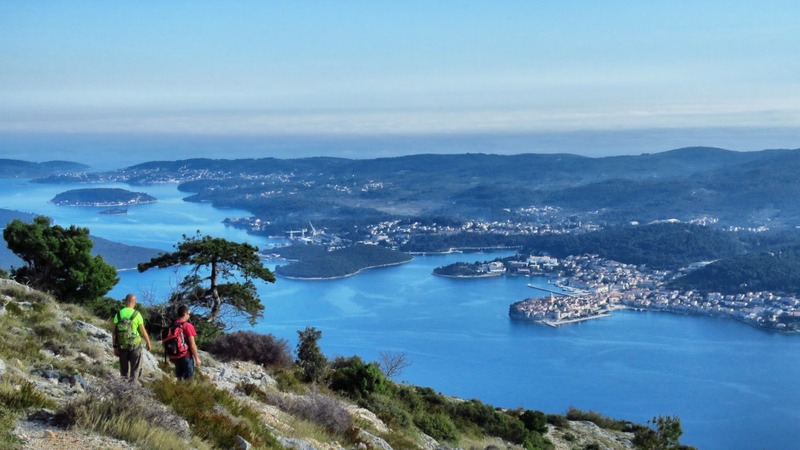 After climbing that peak, the trail leads you to the city of ►Ston (you will find the Croatian version of the Chinese Wall there!). Stage twelve takes you from Ston to ►Srđ, the mountain overlooking the city of Dubrovnik. During the whole way, you have beautiful views of the sea and coastal towns. This stage is 68 km long with 1800 m of elevation gain. And the final, 13th stage, is 74 km long and leads to the southmost point of Croatia. To fulfill your goal, you will have to climb ►Sniježnica mountain and then walk to ►Prevlaka – the most southern south of the country. On your way, you will see some amazing stuff. Besides beautiful views of the sea and islands, you can experience many natural wonders and visit some nice cities. ►Pula, ►Rijeka, ►Opatija, ►Split, ►Omiš, ►Makarska and ►Dubrovnik are just part of the list of the cities lying along the route. 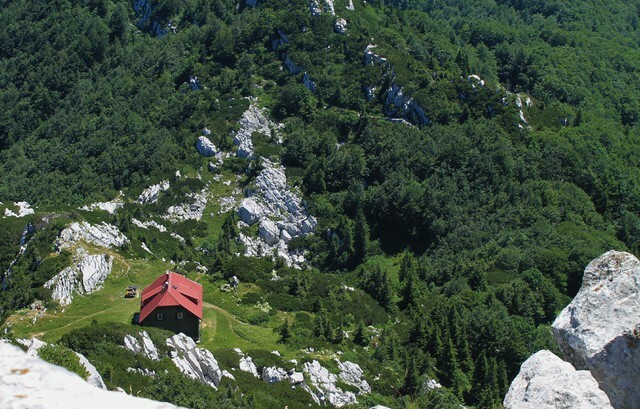 You can play safe and book your accommodation in those places, but you can also stay overnight in unique mountain huts like this in Šugarska Duliba on Velebit (stage four), or this on Risnjak in Gorski kotar (stage two). Also, there are several protected areas on the route: Nature Park ►Učka, National Park ►Risnjak, National Park North Velebit, Nature Park ►Velebit, National Park ►Paklenica, Nature Park ►Biokovo and many other significant landscapes. And of course – enjoy every moment of your beautiful journey on Via Adriatica!